This is an educational project box on the Buffalo Trace. The box is designed so that teachers and other educators can learn and teach about the early transportation route of the American bison, Native Americans, and Pioneer settlers of Indiana and places west. Assistance for the boxes came from many sources and we are very grateful to all our sponsors. This program has been made possible through a matching grant from Indiana Humanities in cooperation with the National Endowment for the Humanities, George Rogers Clark National Historic Park, Indiana Historic Pathways and many volunteers. How Big is a Bison? Where Did the Bison Go? 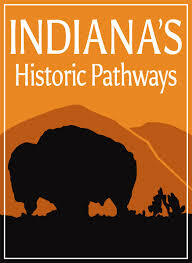 Who Were the Native Americans of Indiana? Reenactment of the 1805 survey of the buffalo trace by William Rector – DVD (2016) by Education Committee of the Initial Point Chapter of the Indiana Society of Professional Surveyors. We hope you get many hours of enjoyment out of the lessons and experiences included in this box of activities. The buffalo trace website at https://buffalotrace.indianashistoricpathways.org/ has more information and resources available, and is an evolving resource. For questions or comments on these boxes please contact the Hoosier National Forest at 812-275-5987.